Here is yet another book to movie that makes me shiver with anticipation, and pray that Hollywood doesn't screw it up, at the same time. 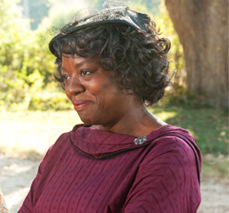 The Help by Kathryn Stockett comes out on the big screen on August 10. Unlike other books of genres like science fiction (The Minority Report), fantasy (The Lord of the Rings), or dystopian (The Hunger Games), I am hoping that The Help can easily make the move onto the big screen while staying true to the story line. The persona is there. I haven't seen much of Emma Stone's work, but I think that is why it will be easy to buy into her playing this character. According to IMDb, Viola Davis has quite an impressive resume. In spite of that, I think I have only see a couple things she's been in. Based on those, I think Davis will do a wonderful job playing Abileen Clark. Again, another actress with a long resume of work I've barely seen (I think I've been under my rock for too long). Based on what I do know, I am a bit worried that Spencer will be able to bring enough attitude to table. Minny's character is mouthy and irreverant, I'm hoping Spencer can be the same. Ok, now "Victoria" I recognize! She played the part of the vicious vampire very well. I look forward to seeing her more subtle, but no less bitchy, side as Hilly Holbrook. I don't know much about Chastain, and judging from her IMDb profile, probably not many people have. I think she's a gorgeous woman, but that's not what I believe Celia Foote is suppose to be. I hope the she can "white trash" it up a bit for the movie; however, based on the set photos, it doesn't appear to have happened. Thankfully, I don't think I'll be terribly disappointed if this movie gets screwed up a bit. The book was written well enough to have stood on the bestseller lists for this long without it. And it will stay forever imprinted in my mind just as it was written.